γ-Aminobutyric acid (GABA) is both a major inhibitory neurotransmitter in the CNS and a product of β cells of the peripheral islets. Our previous studies, and those of others, have shown that T cells express functional GABAA receptors. However, their subunit composition and physiological relevance are unknown. In this study, we show that a subset of GABAA receptor subunits are expressed by CD4+ T cells, including the δ subunit that confers high affinity for GABA and sensitivity to alcohol. GABA at relatively low concentrations down-regulated effector T cell responses to β cell Ags ex vivo, and administration of GABA retarded the adoptive transfer of type 1 diabetes (T1D) in NOD/scid mice. Furthermore, treatment with low dose of GABA (600 μg daily) dramatically inhibited the development of proinflammatory T cell responses and disease progression in T1D-prone NOD mice that already had established autoimmunity. Finally, GABA inhibited TCR-mediated T cell cycle progression in vitro, which may underlie GABA’s therapeutic effects. The immunoinhibitory effects of GABA on T cells may contribute to the long prodomal period preceding the development of T1D, the immunological privilege of the CNS, and the regulatory effects of alcohol on immune responses. Potentially, pharmacological modulation of GABAA receptors on T cells may provide a new class of therapies for human T1D as well as other inflammatory diseases. γ-Aminobutyric acid (GABA)3 is a widely used neurotransmitter in the CNS (reviewed in Refs.1 and 2). GABA is produced by some peripheral tissue cells, such as the β cells of the pancreatic islets (3). GABAA receptors are heteropentameric ligand-gated Cl-channels (1, 2). A multitude of different neuronal GABAA receptors exist due to the combinatorial assembly of its various subunits. Currently, 19 neuronal GABAA receptor subunits have been identified (α1–6, β1–3, γ1–3, δ, ε, θ, π, and ρ1–3). Most GABAA receptors are comprised of two identical α subunits, two identical β subunits, and a single γ subunit. Occasionally, the γ subunit is replaced by a δ, ε, or θ subunit. The different receptor subtypes vary in their affinities for GABA and pharmacological properties (4, 5). Our previous studies have shown that GABA inhibits proinflammatory CD4+ T cell responses in vitro. The inhibition is mimicked by GABAA agonists and blocked by GABAA antagonists (6). Furthermore, we showed that GABA administration inhibited DTH responses to a prototypic foreign Ag. In addition, GABA has also been demonstrated to modulate CD8+ T cell cytotoxicity in vitro (7). These data suggest that functional GABAA receptors are expressed by T cells, and may mediate immunoinhibition. However, the mechanism(s) by which GABAA receptors exert their immunoinhibitory effects and their possible physiological relevance remain to be determined. To further study the nature and biological function of lymphocytic GABAA receptors, we characterized the GABAA receptor subunits expressed by T cells, and the effect of GABA administration on a natural inflammatory process. We chose to study the inflammatory process that T cell autoimmunity spontaneously arises in NOD mice and causes the destruction of their insulin-producing β cells, because this disease process has been well characterized (8, 9). We found that naive T cells expressed at least two different α and β subunits, as well as a δ subunit. The δ subunit has been associated with “extra-synaptic” GABAA receptors and confers GABAA receptor sensitivity to low concentrations of alcohol (10). We observed that T cell activation induced at least one additional GABAA subunit (γ3) expression, which may lead to new ways to pharmacologically modulate activated T cells. Furthermore, we found that GABA at relatively low concentrations had an acute inhibitory action on inflammatory T cell responses directly ex vivo. Administration of low doses of GABA (600 μg daily) dramatically inhibited the development of proinflammatory Th1 responses to β cell Ags and disease progression in prediabetic NOD mice. Finally, we observed that GABA inhibited TCR-mediated T cell cycle progression, which may underlie GABA’s therapeutic effects. We discuss the physiological relevance of these observations. NOD (H-2NOD) and NOD/scid (Taconic Farms, Germantown, NY) mice were bred under specific pathogen-free conditions. In our colony, ∼>85% of the female mice spontaneously develop autoimmune diabetes by 40 wk of age. Only female NOD mice were used in our studies. All experimental procedures were approved by the Chancellor’s Animal Research Committee (University of California, Los Angeles, CA). Mouse glutamic acid decarboxylase (GAD), and control β-galactosidase were prepared as previously described (11). Heat shock protein peptide (HSP277) and hen eggwhite lysozyme peptide (HEL11–25) were synthesized at >95% purity by Multiple Peptide Systems (San Diego, CA). The amino acid sequences of HSP277 and HEL11–25 have been reported elsewhere (12, 13). GABA and insulin B chain were purchased from Sigma-Aldrich (St. Louis, MO). Implantable GABA pellets that slowly released GABA at 600 μg per day over a 21-, 60-, or 90-day period (or 21-, 60-, or 90-day placebo pellets) were made by Innovative Research of America (Sarasota, FL). Splenic mononuclear cells were isolated from 2-wk-old NOD mice and CD4+ T cells were purified to >95% by negative selection as described previously (14). They were used directly (naive T cells), or were activated by stimulation with 4 μg/ml anti-CD3 and anti-CD28 for 24 h in HL-1 medium (BioWhittaker, Walkersville, MD). Total RNA was extracted from naive or activated T cells (107), as well as mouse brain, and reverse transcribed into cDNA using random primers (Superscript kit; Invitrogen Life Technologies, Carlsbad, CA). The cDNA was amplified by PCR using specific oligonucleotide primers that have been previously used for detecting the expression of GABAA α1, α2, α5, β1, β2, β3, γ1, γ3, and δ subunits or β-actin (control), respectively. The sequence of the oligonucleotide primers for the GABAA subunits, their annealing temperatures, and the size of the expected amplification products are listed in Table I⇓. After an initial denaturation step (95°C, 3 min), all of the reactions were annealed at the indicated temperature for 45 s, incubated at 72°C for 60 s, redenatured at 94°C for 45 s, and then subjected to 35 cycles. The effect of GABA on Ag-specific T cell responses in vitro and the impact of treatment with GABA on spontaneous T cell autoimmunity in vivo were determined by the modified ELISPOT assays as previously described (23). Briefly, 106 splenic mononuclear cells were added per well (in duplicate) to an ELISPOT plate that had been coated with cytokine capture Abs and incubated with Ag (100 μg/ml for whole proteins, 7 μM for peptides) in the presence or absence of different concentrations of GABA for 24 h for IFN-γ, or 40 h for IL-4 and IL-5 detection. After washing, biotinylated detection Abs were added and the plates were incubated at 4°C overnight. Bound secondary Abs were visualized using HRP-streptavidin (DakoCytomation, Carpinteria, CA) and 3-amino-9-ethylcarbazole. Abs R4-6A2/XMG 1.2-biotin, 11B11/BVD6-24G2-biotin, and TRFK5/TRFK4-biotin (BD Pharmingen, San Diego, CA) were used for capture and detection of IFN-γ, IL-4, and IL-5, respectively. To examine the effect of GABA on adoptive transfer of type 1 diabetes (T1D), we implanted 8-wk-old female NOD/scid mice with a pellet that slowly released 600 μg GABA daily, over a 21- or 60-day period (or a 21- or 60-day placebo pellet) s.c. behind the neck. The next day, we transfused animals i.v. with 107 diabetogenic splenic mononuclear cells that had been isolated from newly diabetic NOD mice. A group of unimplanted mice received diabetogenic splenic cells as a positive control. To examine whether treatment with GABA modulated the development of diabetogenic T cells, we implanted 6-wk-old NOD mice with a GABA pellet designed to release 600 μg of GABA daily over a 90-day period, or a 90-day placebo pellet. At 16 wk of age, their splenic mononuclear cells, as well as splenic cells from the age-matched unmanipulated NOD mice were transfused into individual 8-wk-old NOD/scid mice (107/mouse), respectively. We also performed the coadoptive transfer assay to examine whether treatment with GABA primed transferable regulatory T cells in prediabetic NOD mice. Six-week-old NOD mice were implanted with a pellet that slowly released 600 μg of GABA daily, over a 90-day period or a 90-day placebo pellet. At 16 wk of age, their splenic mononuclear cells, together with an equal number of splenic cells from newly diabetic NOD mice, were transfused into NOD/scid mice (107/mouse). A control group of mice received an equal number of diabetogenic splenic cells alone. Following the adoptive transfer of splenic cells, urine glucose levels were monitored twice weekly for diabetes onset by Test-tape (Eli Lilly, Indianapolis, IN). After abnormal glucose levels in the urine were detected, the blood glucose levels were measured every other day. Two consecutive blood glucose levels ≥13 mmol/L was considered as T1D onset. Six-week-old NOD mice were implanted with a 90-day GABA-releasing pellet or a placebo pellet. They were reimplanted with the same type of pellet at 20 wk of age. A group of unmanipulated mice was used as control. All mice were monitored for the development of diabetes as described above until they were 52 wk of age. Splenic mononuclear cells were isolated from 2-wk-old NOD mice and stimulated with anti-CD3 (2 μg/ml) and anti-CD28 (5 μg/ml) for 36 h in the presence or absence of GABA (1 mM). CD4+ T cell cycle progression was analyzed using a modified method (24). Briefly, the harvested splenic cells were stained with FITC-anti-CD4, fixed by 0.25% formaldehyde in PBS, permeabilized by 2% Triton X-100, and then stained with propidium iodide (PI) containing 11.25 KU/ml RNase, followed by FACS analysis of the G0/G1, S/G2, and subdipoloid populations. Group comparisons were analyzed by using Student’s t test. Repeated measurements over time were assessed by Life Table analysis. Statistical significance was set at p < 0.05. Our previous studies have shown that GABA, and the agonists for GABAA receptors, but not agonists for GABAB receptors, inhibits Ag-primed T cell responses, indicating that functional GABAA receptors are expressed by T cells. Neuronal GABAA receptors are quite heterogeneous in their subunit composition, and different GABAA receptor subtypes display a range of affinities for GABA and pharmacological properties. Because subunit-specific Abs are currently not available for most murine GABAA receptor subunits, we used RT-PCR to determine which GABAA receptor subunit RNAs were expressed in naive and activated T cells. We purified CD4+ T cells from 2-wk-old NOD mice and activated them with anti-CD3/anti-CD28, isolated their RNA, and subjected the RNA to RT-PCR analysis using GABAA-receptor-specific oligonucleotide primers (Table I⇑). RNA isolated from mouse brain was used as a positive control. All of the tested GABAA receptor subunits could be amplified from mouse brain cDNA with the expected molecular weights (Fig. 1⇓). In contrast, the α1, α2, β1, β2, and δ, but not the α5, β3, and γ1, GABAA receptor subunits could be amplified from cDNA of naive and activated T cells. The size of the amplified DNA fragments from T cell RNA was indistinguishable from those amplified from brain RNA, suggesting that GABAA receptor subunits expressed by CD4+ T cells resemble those of neurons. Although T cells only express a subset of the neuronal GABAA receptor subunits, the expression of two different α subunits, two different β subunits, and a δ subunit in T cells would allow the assemblage of several different heteropentameric GABAA receptor subtypes. Furthermore, while γ3 subunit expression was undetectable in naive CD4+ T cells, its expression was readily and consistently detected in activated CD4+ T cells (Fig. 1⇓). This suggests that T cell activation up-regulates the expression of at least one GABAA receptor subunit. Characterization of GABAA receptor subunits expressed by T cells. PCR products were amplified from mouse brain (B), naive T cell (Tn), and activated T cell (Ta) cDNA using GABAA subunit-specific oligonucleotide primers that span introns in genomic DNA (Table I⇑). All PCR product sizes are the expected molecular weights arising from amplification of the appropriate cDNA, and not genomic DNA. The data shown are representative results from three separate experiments. Next, we examined GABA’s action on autoreactive T cell responses that had been spontaneously primed in prediabetic NOD mice. We isolated splenic mononuclear cells from 8-wk-old NOD mice, well after the spontaneous development of T cell autoimmunity in these mice, and characterized spontaneous T cell responses directly ex vivo to a panel of β cell Ags (GAD, HSP277, and insulin B chain) by ELISPOT assays in the presence or absence of different concentrations of GABA. In the absence of GABA, a high frequency of β cell Ag-specific IFN-γ-secreting, but not IL-4- or IL-5-secreting, T cells was detected to major β cell autoantigens (Fig. 2⇓), consistent with previous reports (25, 26). In the presence of GABA, the frequency of β cell Ag-specific IFN-γ-secreting T cells was significantly reduced. The inhibitory effects of GABA on spontaneous T cell responses to β cell Ags were dose dependent, with inhibitory effects detectable at 100 μM, a level that is likely to be physiologically relevant in the microenvironment of the islets (27). Thus, GABA can have a rapid inhibitory action on activated and effector Th1 cell function in vitro. GABA inhibits spontaneous splenic T cell responses to β cell Ags. Splenic mononuclear cells were isolated from 8-wk-old female NOD mice and their T cell responses to β cell Ags in the presence or absence of different concentrations of GABA (0.1–3 mM) were characterized by the ELISPOT assay. Data are presented as the mean number of spot-forming colonies (SFC) per 106 splenic cells ± SEM from two independent experiments (n = 5). There was no detectable IL-4 and IL-5 response to those Ags (data not shown). Based on the ability of GABA to inhibit spontaneously primed autoreactive T cell responses in vitro, we examined whether GABA could down-regulate the ability of diabetogenic cells to adoptively transfer T1D. NOD/scid mice were implanted with a pellet designed to release GABA over a 21- or a 60-day period. Control groups of NOD/scid mice received a placebo pellet that dissolved over 21 or 60 days. The mice were then transfused with diabetogenic splenic cells from newly diabetic NOD mice. An additional (unimplanted) control group received diabetogenic splenic cells alone. We observed that NOD/scid mice that received a 21- or 60-day slowly dissolving placebo pellet developed diabetes at a rate similar to that of unimplanted mice, with most mice becoming hyperglycemic within 30 days postadoptive transfer (Fig. 3⇓). 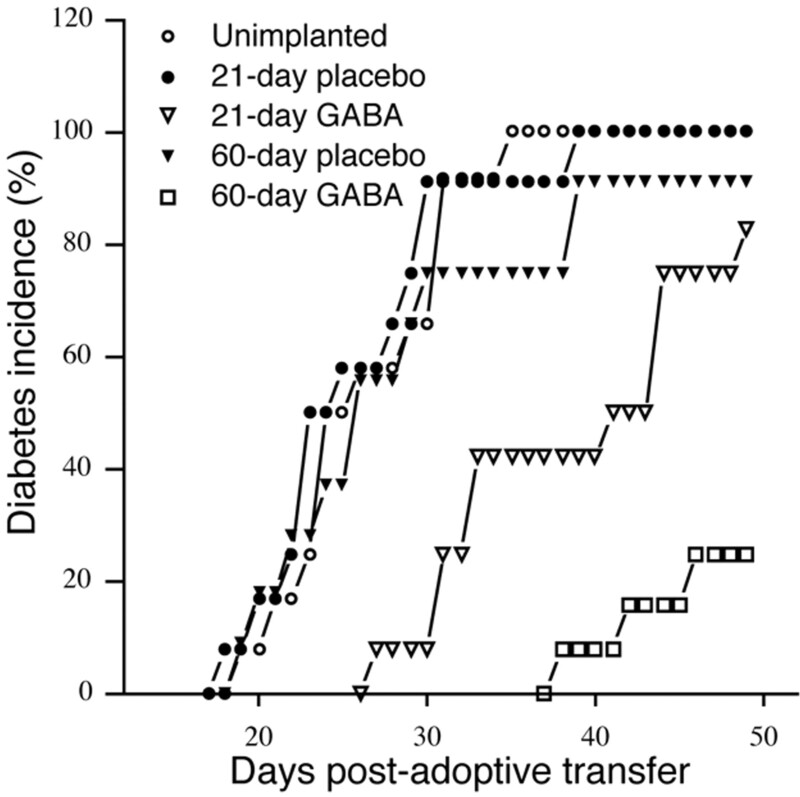 In contrast, only 8% of the mice that had been implanted with a 21-day GABA-releasing pellet developed diabetes within 30 days after adoptive transfer, a significant delay in T1D onset compared with controls (p < 0.042). Mice that received a longer acting 60-day GABA-releasing pellet displayed a longer delay in disease onset, and a lower disease incidence. Hyperglycemia did not appear in this group until 37 days postadoptive transfer, and at the end of the observation period (50 days) only 24% of GABA-treated mice had become hyperglycemic (Fig. 3⇓; p < 0.01). Our data demonstrate that treatment with GABA at a relatively low dose can inhibit diabetogenic T cell function in vivo. The data also suggest that the persistence of GABA may be required to control the diabetogenecity of β cell-specific T cells. GABA inhibits the adoptive transfer of T1D in NOD/scid mice. Groups of NOD/scid mice were implanted with a pellet, releasing GABA over a 21- or 60-day period or a placebo pellet, and they were transfused with diabetogenic splenic cells isolated from newly diabetic NOD mice (n = 12 for each group). Urine and blood glucose levels were monitored frequently, and animals were considered diabetic after two consecutive blood glucose levels of >13 mmol/L. Next, we investigated whether treatment with GABA could modulate disease progression in prediabetic NOD mice. NOD mice at 6 wk of age (with established autoimmunity) were implanted with a pellet designed to release GABA over a 90-day period. The mice were reimplanted with a GABA pellet at 20 wk of age, such that the mice received GABA treatment until they were 35 wk of age. Control groups received 90-day placebo pellets or were unmanipulated. The mice were monitored for diabetes onset up to 1 year in age. Both unmanipulated mice and those receiving the placebo pellet developed diabetes at similar rates, with 90% of the mice developing diabetes by 40 wk of age (Fig. 4⇓). In contrast, none of the GABA-treated mice became hyperglycemic within 40 wk of age. 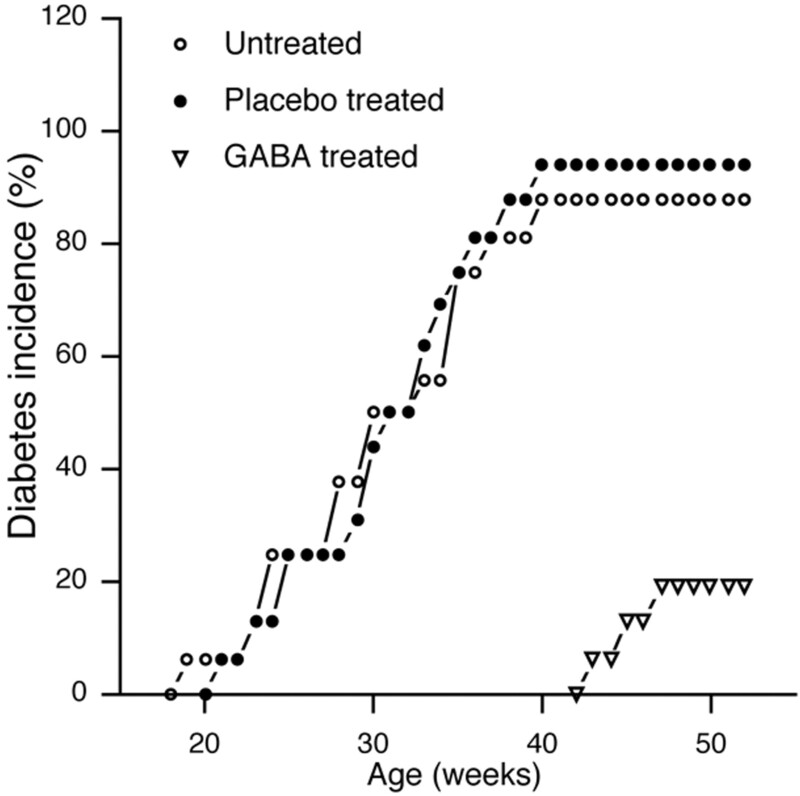 Even though GABA treatment ceased after ∼35 wk of age, only 19% of the GABA-treated mice developed diabetes within the 1-year observation period (p < 0.002). Thus, systemic treatment with relatively small dose of GABA inhibits disease progression in prediabetic NOD mice. GABA inhibits disease progression in prediabetic NOD mice. NOD mice at 6 wk of age were implanted with a pellet, releasing GABA over a 90-day period, or a placebo pellet, and at 20 wk of age they were reimplanted with the same type of pellet (n = 16 for each group). A group of age-matched unmanipulated NOD mice was used as control. Urine and blood glucose levels were monitored up to mice at 1 year of age, and animals were considered diabetic after consecutive blood glucose levels of >13 mmol/L. To understand the mechanism(s) underlying the inhibitory action of GABA on the process of spontaneous autoimmunity in NOD mice, we examined how treatment with GABA modulated the spontaneous development of autoreactive T cell responses. Six-week-old NOD mice were implanted with a 60-day GABA-releasing or placebo pellet. At 12 wk of age, their splenic cells, as well as splenic cells from age-matched unmanipulated NOD mice, were characterized for T cell responses to a panel of β cell Ags by ELISPOT assays in the absence of GABA in vitro (Fig. 5⇓). Mice implanted with a placebo pellet had a frequency of IFN-γ-secreting T cells responding to β cell Ags similar to that of unmanipulated NOD mice. In contrast, the NOD mice implanted with a GABA pellet displayed lower frequency of IFN-γ-secreting T cells responding to β cell Ags, indicating that treatment with GABA had inhibited the development of spontaneous T cell autoimmunity. For example, the frequency of GAD-specific IFN-γ-secreting T cells in the GABA-treated mice was 39% of that in the placebo-treated mice (p < 0.01). We did not detect any IL-4 and IL-5 responses to the tested β cell Ags and significant change in the levels of Abs against GAD and insulin (data not shown), suggesting that treatment with GABA did not induce Th2 responses that may have actively down-regulated the development of Th1-type autoimmunity. 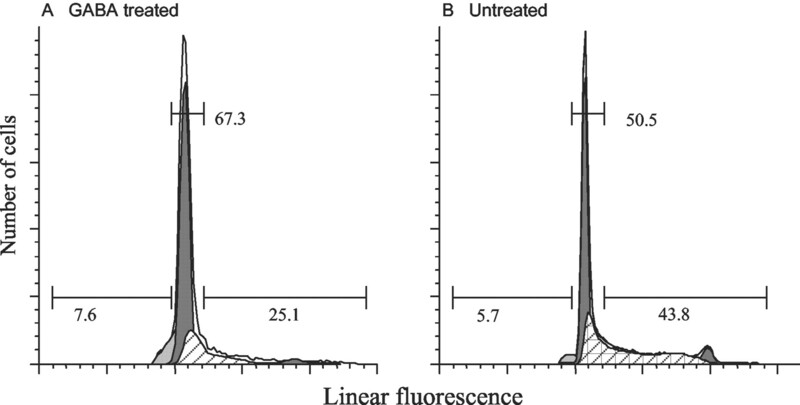 Histological examination of mononuclear cell infiltration in the pancreata showed that the overall insulitis score for pancreata from the GABA-treated mice (1.01 ± 0.22) was significantly reduced as compared with that from placebo-treated mice (2.29 ± 0.07) and unmanipulated mice (2.18 ± 0.13). The inhibition of both splenic Th1 responses to β cell Ags and mononuclear cell infiltration in the islets suggests that GABA treatment may predominantly circumvent the development of diabetogenic T cells and limit the expansion of autoreactive cells in prediabetic NOD mice. Treatment with GABA inhibits spontaneous T cell responses to β cell Ags in prediabetic NOD mice. NOD mice at 6 wk of age were implanted with a pellet, releasing GABA over a 60-day period, or a placebo pellet, and at 12 wk of age their splenic T cells and the splenic cells isolated from age-matched unmanipulated NOD mice were characterized for responses to β cell Ags in the absence of GABA by the ELISPOT assay. Data were presented as the mean number of spot-forming colonies (SFC) per 106 splenic cells ± SEM. Mice from control and experimental groups (n = 5 for each group) were tested simultaneously in two independent experiments. All of the mice had undetectable levels of IL-4- and IL-5-secreting T cell responses to all of the tested Ags (data not shown). None of the control Ags (β-galactosidase and HEL11–25) induced significant splenic T cell IFN-γ responses (data not shown). The diminished development of autoreactive Th1 responses in GABA-treated NOD mice may have been mediated by other types of regulatory T cell responses, like Th3, Tr1, or CD4+CD25+ T cells, that were up-regulated by GABA treatment (28, 29, 30). To test for this possibility, we implanted 6-wk-old NOD mice with a 90-day GABA-releasing or placebo pellet. At 16 wk of age, their splenic cells were isolated and adoptively transferred, together with splenic cells from newly diabetic NOD mice, to NOD/scid mice. 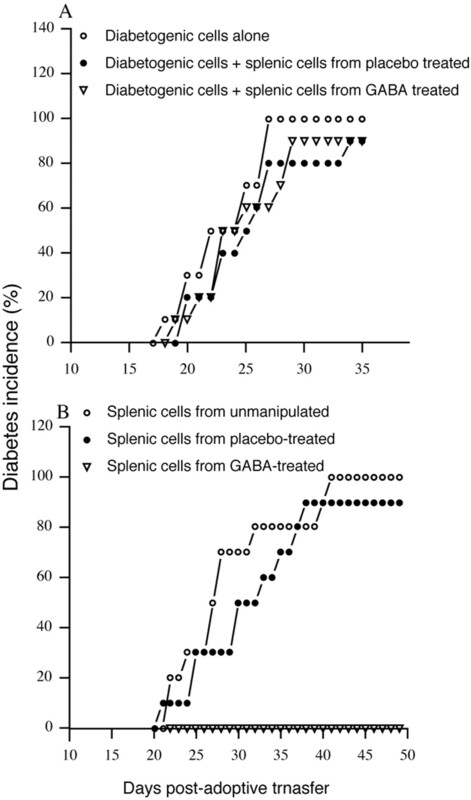 Mice that received diabetogenic splenic cells together with splenic cells from GABA- or placebo pellet-treated mice developed diabetes at a similar rate to control mice that received only diabetogenic splenic cells (Fig. 6⇓A). Apparently, treatment with GABA did not induce transferable regulatory T cell responses. Treatment with GABA fails to induce transferable regulatory T cell responses, rather circumvents the development of diabetogenic T cells in prediabetic NOD mice. A, GABA treatment did not induce regulatory T cell responses. NOD mice at 6 wk of age were implanted with a pellet, releasing GABA over a 90-day period, or a placebo pellet, and at 16 wk of age their splenic cells, together with diabetogenic splenic cells isolated from newly diabetic NOD mice, were transfused to NOD/scid mice (n = 10 for each group), respectively. A group of NOD/scid mice that received an equal number of diabetogenic splenic cells alone was used as positive control. B, GABA treatment circumvents the development of diabetogenic T cells. Six-week-old NOD mice were implanted with a pellet, releasing GABA over a 90-day period, or a placebo pellet, and at 16 wk of age their splenic mononuclear cells, as well as splenic cells isolated from age-matched unmanipulated NOD mice, were transfused to NOD/scid mice (n = 12). Urine and blood glucose levels were monitored frequently, and animals were considered diabetic after two consecutive blood glucose levels of >13 mmol/L. A second set of adoptive transfer experiments provided additional evidence that GABA treatment inhibits the development of spontaneous Th1 autoimmunity. Six-week-old NOD mice were implanted with a 90-day GABA-releasing or placebo pellet, and at 16 wk of age, their splenic cells were transfused into NOD/scid mice. If sufficient diabetogenic effector T cells were present in the GABA- or placebo-treated NOD mice, their splenic T cells should adoptively transfer T1D to NOD/scid mice. Surprisingly, none of the NOD/scid mice that received splenic cells from the GABA-treated NOD mice developed diabetes during the observation period (Fig. 6⇑B). In contrast, mice that received splenic cells from the placebo-treated mice developed diabetes at the same rate as the positive control mice that received splenic cells from age-matched unmanipulated NOD mice. Together, the significantly reduced spontaneous Th1 autoimmunity and the inability of their splenic T cells to induce diabetes in NOD/scid mice suggest that treatment with GABA predominantly affects the development of pathogenic Th1 cells in prediabetic NOD mice. Given the reduced Th1 responses and the lack of detectable induced regulatory responses in GABA-treated NOD mice, we hypothesized that the therapeutic action of GABA may be mediated by its interference with T cell division. To test this hypothesis, we isolated splenic mononuclear cells from 2-wk-old NOD mice and activated T cells with anti-CD3 and anti-CD28 in the presence or absence of GABA. The cells were stained with FITC-anti-CD4 and PI to determine CD4+ T cell cycle progression by FACS analysis (Fig. 7⇓). The CD4+ T cells that had been stimulated with anti-CD3 and anti-CD28 in the absence of GABA contained ∼42.8% cells already in the S/G2 phase, while only 25.1% CD4+ T cells that were treated with GABA reached the S/G2 phase. Instead, a greater population of GABA-treated CD4+ T cells remained in the G0/G1 phases as compared with that in T cells without GABA treatment (p < 0.03). These data suggest that GABA inhibits the TCR-mediated T cell-cycling process. However, the arrest of TCR-mediated T cell cycling by GABA treatment did not lead to T cell apoptosis. Indeed, following GABA treatment, the subdiploid population of CD4+ T cells was similar to that of control T cells, which was further demonstrated by costaining with FITC-Annexin V and PI (data not shown). Together, these data suggest that treatment with GABA does not cause a significant increase in CD4+ T cell apoptosis. This inhibitory effect of GABA on the TCR-mediated T cell-cycling process may mediate the therapeutic action of GABA on spontaneous T cell autoimmunity and disease progression in prediabetic NOD mice. GABA inhibits TCR-mediated T cell cycling. Splenic mononuclear cells were isolated from 2-wk-old female NOD mice and were stimulated with anti-CD3 and anti-CD28 in the presence or absence of GABA. The cells were fixed, permeabilized, and then stained with FITC-anti-CD4 and PI. Flow cytometry profiles are PI staining of CD4+ population. Subdiploid, diploid, and supradiploid populations are indicated. Data are representative of three independent experiments. A similar pattern of the inhibitory effect of GABA on CD4+ T cell cycling was observed by using splenic mononuclear cells isolated from 8-wk-old NOD (data not shown). Our previous studies, and those of others, have shown that T cells express functional GABAA receptors (6, 7). We characterized the subunit composition of murine lymphocytic GABAA receptors by RT-PCR. We found that GABAA receptor subunits (α1, α2, β1, β2, and δ), commonly expressed by neurons, were expressed by naive and activated CD4+ T cells. Although this only represents a subset of subunits expressed in the CNS, it is sufficient to form different heteropentameric GABAA receptor subtypes. Notably, GABAA receptors containing the δ subunit have a unique localization on neuron with ∼50-fold increase in affinity for GABA (31). The δ subunit has been shown to enhance GABAA receptor activity in the presence of low concentrations of alcohol known to affect humans (10). Consequently, the lymphocytic GABAA receptors containing the δ subunit may contribute to the reported inhibitory effects of alcohol consumption on Th1 responses (32, 33). Interestingly, we observed that induction of CD4+ T cell activation induced the γ3 subunit expression, suggesting that not all GABAA receptor subunits are expressed constitutively, but some are also inducible in T cells. This subunit may play a role in some specialized function in activated T cells, providing new approaches to pharmacologically modulate activated T cell function. In examination of the effect of GABA on the inflammatory immune responses in the well-characterized mouse T1D model, we found that GABA at relatively low concentrations (100 μM) inhibited activated T cell responses against islet autoantigens when assayed directly ex vivo in a short-term ELISPOT assay. Thus, GABA can have rapid immunoinhibitory action on effector T cell function in vitro. Administration of low doses of GABA significantly inhibited the adoptive transfer of T1D, suggesting that GABA down-regulates diabetogenic effector T cell function in vivo. 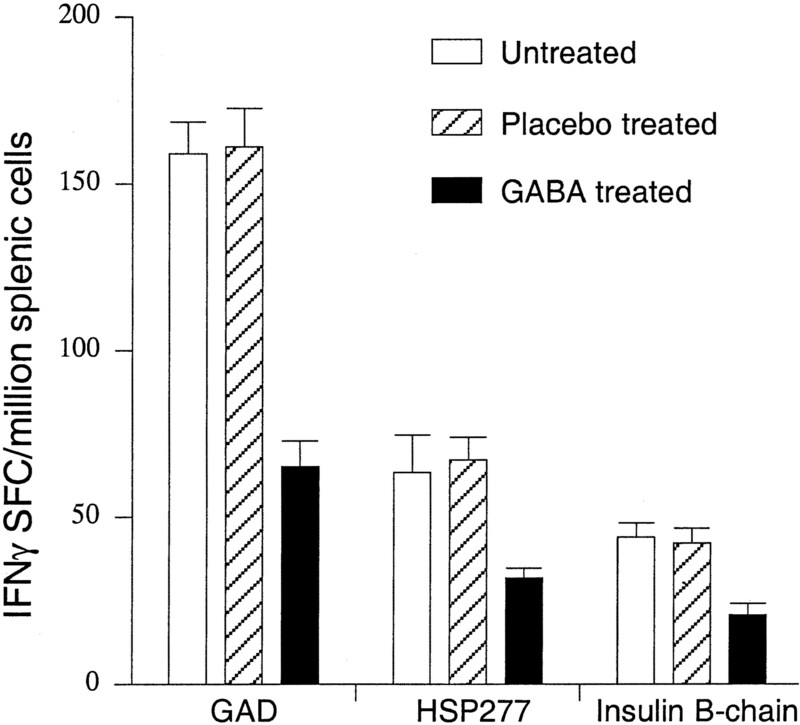 Furthermore, treatment with GABA inhibited disease progression in prediabetic NOD mice. Although ≥90% of the mice in control groups developed T1D by 40 wk of age, none of the GABA-treated mice became hyperglycemic within this time period. After 40 wk in age, long after the GABA releasing pellet had completely dissolved (at ∼35 wk in age), only 19% of mice developed T1D through the 1-year observation period. The therapeutic effect of GABA is unlikely to be mediated by regulatory T cells. First, we failed to detect any β cell Ag-specific Th2 responses in the GABA-treated mice. Furthermore, coadoptive transfer of splenic cells from GABA-treated mice with diabetogenic T cells failed to modulate the autoimmune diabetes process in the recipients. These data indicate that treatment with GABA does not promote development of transferable regulatory T cells. Rather, it is the inhibition of diabetogenic T cell development and function that may mediate the therapeutic effect of GABA on disease progression in prediabetic NOD mice. This contention is supported by the findings that significantly decreased Th1 autoimmunity displayed in GABA-treated mice and splenic mononuclear cells from GABA-treated mice failed to adoptively transfer T1D to NOD/scid mice. Thus, GABA not only down-regulates effector Th1 responses to β cell Ags, but also inhibits the development of pathogenic T cells. Given the inhibition of inflammatory responses in vivo, and the absence of any detectable regulatory responses, we hypothesized that the therapeutic effects of GABA may be mediated through affecting T cell division. Following TCR engagement with MHC/peptide complexes, Ca2+ influx is required for the activation of naive T cells as well as effector T cell function (34). Murine T cells have membrane potentials between −50 and −70 mV, and a high concentration of intracellular chloride (30–40 mM) with a Cl− equilibrium potential of approximately −35 mV (35, 36). Consequently, GABA, through lymphocytic GABAA receptors, regulates the Cl− channel to cause T cell depolarization. The depolarization in T cells interferes with the influx of Ca2+ through mitogen-activated Ca2+ channels (37, 38). Consistent with the notion that activation of lymphocytic GABAA receptors inhibits the T cell activation cascade, we found that GABA arrested T cell cycling predominantly in the G0/G1 phase. This inhibition of T cell cycling is likely to account for rapid inhibitory effect of GABA on activated T cell responses when assayed directly ex vivo, and to account for therapeutic effects of GABA on disease progression in prediabetic NOD mice. Although arrest of T cell cycling is usually accompanied by T cell apoptosis (24), we found that treatment with GABA did not significantly result in activated T cell apoptosis. Indeed, treatment with GABA did not significantly alter the total numbers of splenic mononuclear cells and percentages of CD4+, CD8+ T and B lymphocytes (our unpublished observation). These, together with the observation that suppression of diabetogenic T cell function appears to require the persistent presence of GABA, suggest that the inhibitory effect of GABA on T cells should not cause long-term immune deficiencies. Because GABA is present at high levels only in the CNS and in the microenvironment of the pancreatic islets, the question arises what physiological function GABAA receptors serve on naive and activated T cells. Notably, the δ subunit is expressed by T cells, such that lymphocytic GABAA receptors have especially high affinity for GABA. We propose that GABA via activating lymphocytic GABAA receptors may contribute to the immunological privilege of the CNS. As we have shown, GABA has an acute inhibitory action on both activated T cell function and T cell cycling. These inhibitory functions are well suited for suppressing inflammatory processes in the CNS. The concentration of GABA in blood is ∼3 μM (39), which is well below the threshold (≈100 μM) at which we observe GABA-mediated inhibition of T cell function. However, the concentration of GABA in brain neuronal synapses can reach ≥1 mM (40), which is considerably above the level at which we begin to detect GABA-mediated inhibition of T cell function and cycling. The immunoinhibitory effects of GABA could also play a role in the long prodomal period preceding the development of T1D, as the insulin-producing β cells also secrete GABA (40, 41), which in the microenvironment of the islets does reach sufficient levels to down-regulate infiltrating effector T cells (27). Furthermore, insulin has been shown to up-regulate neuronal GABAA receptor expression (42). If insulin also increases the expression of GABAA receptors on islet-infiltrating T cells, it could enhance the immunoinhibitory effect of GABA on T cell function. Finally, as benzodiazepines can also bind to GABAA receptors, our findings may provide a new mechanism underlying the pharmacological action of benzodiazepines in T cell immunity (43, 44). In summary, we have shown that a subset of GABAA receptor subunits are expressed by T cells and they are sufficient to form different heteropentameric GABAA receptor subtypes on T cells. GABA at relatively low concentrations can have a dramatic effect on effector T cell development and function both in vitro and in vivo. Its immunoinhibitory effect appears to be mediated by arresting T cell cycling. Numerous drugs have been developed for the pharmacological modulation of GABAA receptors. As GABAA receptors have been shown to be expressed on human lymphocytes, our findings suggest that pharmacological modulation of lymphocytic GABAA receptors may provide a new class of therapies for human inflammatory diseases. We are especially grateful to Dr. Richard Olsen for his advice and thank Brenda Lopes for her technical help. ↵1 This work was supported by grants from the National Institutes of Health and Juvenile Diabetes Foundation International. ↵3 Abbreviations used in this paper: GABA, γ-aminobutyric acid; T1D, type 1 diabetes; GAD, glutamic acid decarboxylase; HSP, heat shock protein; HEL, hen eggwhite lysozyme; PI, propidium iodide. Olsen, R. W., A. J. Tobin. 1990. Molecular biology of GABAA receptors. FASEB J. 4:1469. Lüddens, H., E. R. Korpi, P. H. Seeburg. 1995. GABAA/benzodiazepine receptor heterogeneity: neurophysiological implications. Neuropharmacology 34:245. Erdo, S. L., J. R. Wolff. 1990. γ-Aminobutyric acid outside the mammalian brain. J. Neurochem. 54:363. Bureau, M. H., R. W. Olsen. 1993. GABAA receptor subtypes: ligand binding heterogeneity demonstrated by photoaffinity labeling and autoradiography. J. Neurochem. 61:1479. Whiting, P. J.. 2003. The GABAA receptor gene family: new opportunities for drug development. Curr. Opin. Drug. Discov. Devel. 6:648. Tian, J., C. Chau, T. G. Hales, D. L. Kaufman. 1999. GABAA receptors mediate inhibition of T cell responses. J. Neuroimmunol. 96:21. Bergeret, M., M. Khrestchatisky, E. Tremblay, A. Bernard, A. Gregoire, C. Chany. 1998. GABA modulates cytotoxicity of immunocompetent cells expressing GABAA receptor subunits. Biomed. Pharmacother. 52:214. Bach, J. F., D. Mathis. 1997. The NOD mouse. Res. Immunol. 148:285. Singh, B., T. L. Delovitch. 2000. Immune mechanisms that regulate susceptibility to autoimmune type I diabetes. Clin. Rev. Allergy Immunol. 19:247. Wallner, M., H. J. Hanchar, R. W. Olsen. 2003. Ethanol enhances α4β3δ and α6β3δ γ-aminobutyric acid type A receptors at low concentrations known to affect humans. Proc. Natl. Acad. Sci. USA 100:15218. Kaufman, D. L., M. Clare-Salzler, J. Tian, T. Forsthuber, G. S. Ting, P. Robinson, M. A. Atkinson, E. E. Sercarz, A. J. Tobin, P. V. Lehmann. 1993. Spontaneous loss of T-cell tolerance to glutamic acid decarboxylase in murine insulin-dependent diabetes. Nature 366:69. Elias, D., H. Marcus, T. Reshef, V. Ablamunits, I. R. Cohen. 1995. Induction of diabetes in standard mice by immunization with the p277 peptide of a 60-kDa heat shock protein. Eur. J. Immunol. 25:2851. Deng, H., R. Apple, M. Clare-Salzler, S. Trembleau, D. Mathis, L. Adorini, E. Sercarz. 1993. Determinant capture as a possible mechanism of protection afforded by major histocompatibility complex class II molecules in autoimmune disease. J. Exp. Med. 178:1675. Tian, J., D. Zekzer, L. Hanssen, Y. Lu, A. Olcott, D. L. Kaufman. 2001. Lipopolysaccharide-activated B cells down-regulate Th1 immunity and prevent autoimmune diabetes in nonobese diabetic mice. J. Immunol. 167:1081. Khrestchatisky, M., A. J. MacLennan, M. Y. Chiang, W. T. Xu, M. B. Jackson, N. Brecha, C. Sternini, R. W. Olsen, A. J. Tobin. 1989. A novel α subunit in rat brain GABAA receptors. Neuron 3:745. Khrestchatisky, M., A. J. MacLennan, N. J. Tillakaratne, M. Y. Chiang, A. J. Tobin. 1991. Sequence and regional distribution of the mRNA encoding the α2 polypeptide of rat γ-aminobutyric acid A receptors. J. Neurochem. 56:1717. Malherbe, P., E. Sigel, R. Baur, E. Persohn, J. G. Richards, H. Mohler. 1990. Functional expression and sites of gene transcription of a novel α subunit of the GABAA receptor in rat brain. FEBS Lett. 260:261. Ymer, S., A. Draguhn, M. Kohler, P. R. Schofield, P. H. Seeburg. 1989. Sequence and expression of a novel GABAA receptor α subunit. FEBS Lett. 258:119. Lolait, S. J., A. M. O’Carroll, K. Kusano, J. M. Muller, M. J. Brownstein, L. C. Mahan. 1989. Cloning and expression of a novel rat GABAA receptor. FEBS Lett. 246:145. Ymer, S., A. Draguhn, W. Wisden, P. Werner, K. Keinanen, P. R. Schofield, R. Sprengel, D. B. Pritchett, P. H. Seeburg. 1990. Structural and functional characterization of the γ1 subunit of GABAA/benzodiazepine receptors. EMBO J. 9:3261. Knoflach, F., T. Rhyner, M. Villa, S. Kellenberger, U. Drescher, P. Malherbe, E. Sigel, H. Mohler. 1991. The γ3-subunit of the GABAA-receptor confers sensitivity to benzodiazepine receptor ligands. FEBS Lett. 293:191. Shivers, B. D., I. Killisch, R. Sprengel, H. Sontheimer, M. Kohler, P. R. Schofield, P. H. Seeburg. 1989. Two novel GABAA receptor subunits exist in distinct neuronal subpopulations. Neuron 3:327. Tian, J., P. V. Lehmann, D. L. Kaufman. 1997. Determinant spreading of T helper 2 (TH2) responses to pancreatic islet autoantigens. J. Exp. Med. 186:2039. Tian, J., M. Clare-Salzler, A. Herschenfeld, B. Middleton, D. Newman, R. Mueller, S. Arita, C. Evans, M. A. Atkinson, Y. Mullen, et al 1996. Modulating autoimmune responses to GAD inhibits disease progression and prolongs islet graft survival in diabetes-prone mice. Nat. Med. 2:1348. Tisch, R., X. D. Yang, S. M. Singer, R. S. Liblau, L. Fugger, H. O. McDevitt. 1993. Immune response to glutamic acid decarboxylase correlates with insulitis in non-obese diabetic mice. Nature 366:72. Reetz, A., M. Solimena, M. Matteoli, F. Folli, K. Takei, P. De Camilli. 1991. GABA and pancreatic β-cells: colocalization of glutamic acid decarboxylase (GAD) and GABA with synaptic-like microvesicles suggests their role in GABA storage and secretion. EMBO J. 10:1275. Weiner, H. L.. 1997. Oral tolerance: immune mechanisms and treatment of autoimmune diseases. Immunol. Today 18:335. Groux, H., A. O’Garra, M. Bigler, M. Rouleau, S. Antonenko, J. E. de Vries, M. G. Roncarolo. 1997. A CD4+ T-cell subset inhibits antigen-specific T-cell responses and prevents colitis. Nature 389:737. Read, S., V. Malmstrom, F. Powrie. 2000. Cytotoxic T lymphocyte-associated antigen 4 plays an essential role in the function of CD25+CD4+ regulatory cells that control intestinal inflammation. J. Exp. Med. 192:295. Saxena, N. C., R. L. Macdonald. 1994. Assembly of GABAA receptor subunits: role of the δ subunit. J. Neurosci. 14:7077. Waltenbaugh, C., K. Vasquez, J. D. Peterson. 1998. Alcohol consumption alters antigen-specific Th1 responses: mechanisms of deficit and repair. Alcohol. Clin. Exp. Res. 22:(Suppl. 5):220S. Zisman, D. A., R. M. Strieter, S. L. Kunkel, W. C. Tsai, J. M. Wilkowski, K. A. Bucknell, T. J. Standiford. 1998. Ethanol feeding impairs innate immunity and alters the expression of Th1- and Th2-phenotype cytokines in murine Klebsiella pneumonia. Alcohol. Clin. Exp. Res. 22:621. Alberola-Ila, J., S. Takaki, J. D. Kerner, R. M. Perlmutter. 1997. Differential signaling by lymphocyte antigen receptors. Annu. Rev. Immunol. 15:125. Felber, S. M., M. D. Brand. 1982. Factors determining the plasma-membrane potential of lymphocytes. Biochem. J. 204:577. Lewis, R. S., P. E. Ross, M. D. Cahalan. 1993. Chloride channels activated by osmotic stress in T lymphocytes. J. Gen. Physiol. 101:801. Lewis, R. S., M. D. Cahalan. 1995. Potassium and calcium channels in lymphocytes. Annu. Rev. Immunol. 13:623. Cahalan, M. D., R. S. Lewis. 1994. Regulation of chloride channels in lymphocytes. Curr. Top. Membr. Transp. 42:103.
Cooper, J. R., F. E. Bloom, R. H. Roth. 1986. The Biochemical Basis of Neuropharmacology 5th Ed. Oxford University Press, Oxford. Mody, I., Y. De Koninck, T. S. Otis, I. Soltesz. 1994. Bridging the cleft at GABA synapses in the brain. Trends Neurosci. 17:517. Rorsman, P., P. O. Berggren, K. Bokvist, H. Ericson, H. Mohler, C. G. Ostenson, P. A. Smith. 1989. Glucose-inhibition of glucagon secretion involves activation of GABAA-receptor chloride channels. Nature 341:233. Wan, Q., Z. G. Xiong, H. Y. Man, C. A. Ackerley, J. Braunton, W. Y. Lu, L. E. Becker, J. F. MacDonald, Y. T. Wang. 1997. 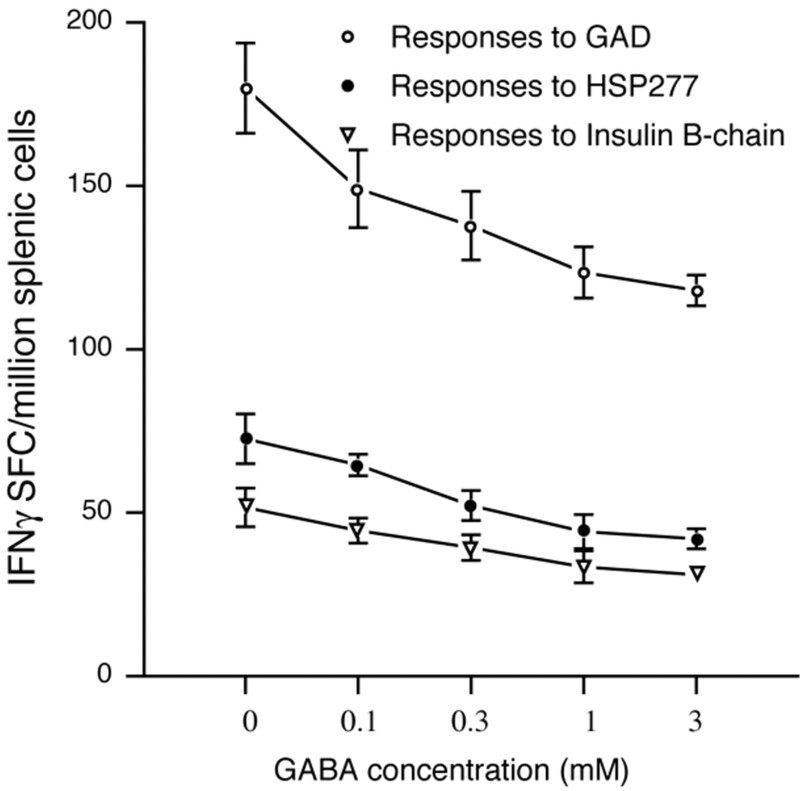 Recruitment of functional GABAA receptors to postsynaptic domains by insulin. Nature 388:686. Arora, P. K., E. E. Hanna, S. M. Paul, P. Skolnick. 1987. Suppression of the immune response by benzodiazepine receptor inverse agonists. J. Neuroimmunol. 15:1. Zavala, F.. 1997. Benzodiazepines, anxiety and immunity. Pharmacol. Ther. 75:199.